A partnership between the Borough of Bound Brook and New Jersey American Water will give kayak and canoe enthusiasts a new access point to the Raritan River. The agreement between the Borough and New Jersey American Water allows the public to put their watercraft into the River in an area owned by NJAW under the Queens Bridge in the Borough. 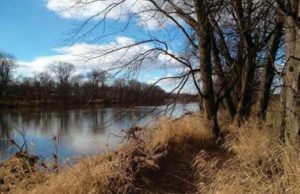 “This launch site for kayaks and canoes is part of a bigger plan to restore public access to the Raritan River. In 2015, the Borough’s Economic Development Advisory Committee published Riverfront Access Plan for Pedestrians and Bicyclists,” said Bound Brook Council President Abel Gomez. The Borough received a technical assistance award from the National Park Service’s Rivers, Trails & Conservation Assistance Program in 2017 and 2018. The NPS helped form a steering committee made of local stakeholders including New Jersey American Water, Somerset County Planning Division, Rutgers University Edward J. Bloustein School of Planning and Public Policy, Pfizer, and members of the Borough’s Economic Development Advisory Committee. The Borough of Bound Brook and New Jersey American Water will formally open Bound Brook’s Riverfront Access Launch at noon on Saturday, May 5, 2018. The launch is located under the Queens Bridge in Bound Brook. RSVP required. For more information about the kayak and canoe launch site or to RSVP for the ribbon cutting ceremony, contact Bound Brook Borough Administrator Hector Herrera 732-893-8520. 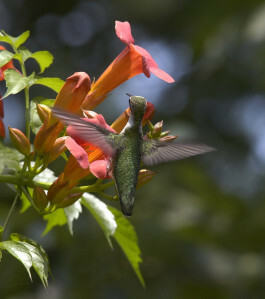 A hummingbird and orange trumpet flower engage in an evolutionary dance of equal partnership that has lasted for eons. The flower not only took advantage of an array of pollinators but also stole the heart of man who would seek to propagate flowers far beyond their natural range and ability to survive. A name logically follows the existence of an idea, a person, place or a thing and forever provides an instant reference, complete with assigned identifiable characteristics. 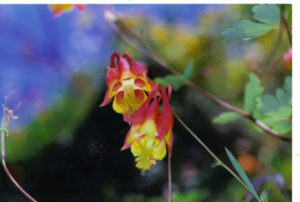 So before there was a month named May, a segment of time existed in nature where birth and bloom dominated the season. The mythology from which the name of May arose was based on the same natural observations seen today. Stories of the stars and the gods became the reference points displayed on the night sky overhead projector to help explain observed phenomenon. The poetic phrase, “April showers bring May flowers” provides information sufficient enough for most people to understand the season. Instead of placing flowers at the altar of the goddess Maia we now send flowers to our mothers on a day designated to show her our appreciation, same story, different day. Going back to the time before May, can you imagine discovering the first flower ever to bloom? In retrospect it would have meant that some plant had evolved to take advantage of a new method of pollination that relied on insects rather than wind. At the time of discovery, however, the moment had to be absolutely magical. Here was something so different in structure, color, scent and profusion that it instantly intensified a fledgling human emotion that speaks to the appreciation of beauty. The flower not only took advantage of insect pollinators but at that moment stole the heart of man who would later seek to propagate flowers far beyond their natural range and ability to survive. 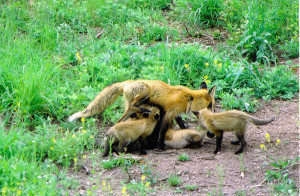 Watching a rambunctious fox pup at a distance, I saw what appeared to be orange pollen on its solid black nose. As the pup was playing around the daylilies I imagined he stuck his nose inside a funnel shaped orange flower, designed for bees and hummingbirds, to come away with the telltale signs of brightly colored pollen grains. If he sniffed a few more flowers he actually became the “bee” and a willing, if not random, participant in asexual reproduction. The part that serendipity plays in nature and science can never be underestimated and its potential never unappreciated when unprecedented success results. Fox pups are not the only pollinators unknowingly pressed into service by the ingenious evolutionary design of flowers. It is a laugh riot, for some reason, to see a dusting of yellow or orange pollen on the nose of a child or adult who sniffs a flower in pursuit of its scent. Eyes closed, as if about to plant a kiss, the human pollinator presses forward until nose touches stamen. The entire event, so instinctive and innocently conducted, that the “bee” comes away unaware of its role in the evolutionary drama of species reproduction and survival. A kind friend will of course bring attention to the dusting of pollen left by such an intimate encounter and be trusted to address it discreetly. Bees of all kind have ‘pollen baskets’ on their back legs which hold an accumulation of pollen grains that appear as large colorful round beads on opposite back legs. Watch one of those big furry yellow and black bees and you can easily see the lumps of colorful pollen that varies from flower to flower. 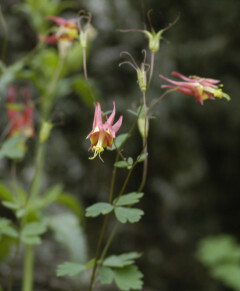 Paddling along the south branch, wild columbine can now be seen in select places on north and west facing red shale cliffs. These delicate plants grow from roots wedged between the layered red shale well above the surface of the water. 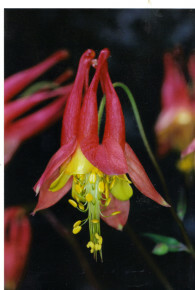 The reddish pink tubular flowers with a common yellow center resemble a group of ice cream cones joined to form a common opening which leads to several individual tails. This structure encourages contact with the centrally located pollen that has to be brushed against in order to reach several sources of nectar located in each tail. This flower must have had a hummingbird sitting on the design team who decided not only the flowers structure but the time the flower was set to bloom. Hummers arriving in early spring from Mexico and Central America have a ready source of food to replenish the energy spent in their annual migration north. Consider the greatest mayflower of all and the part it played in another notable migration. The “Mayflower”, was a ship that sailed to our shores bearing its human pollen to establish new life on the North American continent The ship, so named by unknown whimsy and intended as a supply barge, grew to evolve much as early flowers did into an effective delivery system directed by nothing more than chance. Like a flower it bloomed, spread its pollen and ‘died back’ soon after returning to England. 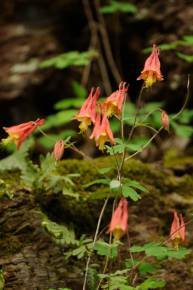 May apples, Virginia bluebells, trout lilies, trillium, jack-in-the pulpits and spring beauties are a small sample of local May flowers that represent the spectrum of a floral legacy whose genealogy traces back to the earliest flowers. Consider that flowers are living things that in some magical way recruited man to further their propagation in exchange for a glimpse of eternal beauty, dreams and imagination to expand the universe of human potential with unbounded creativity and expression. 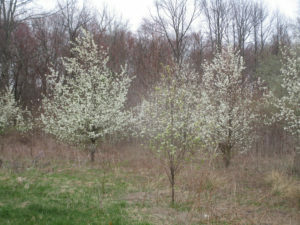 Callery pear trees taking over a field in Monroe, Middlesex County. 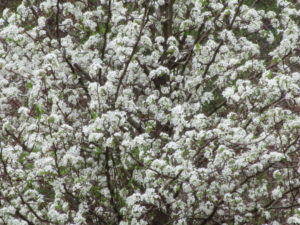 CALLERY PEAR TREES: Have you noticed the trees of blooming white flowers in abundance during your travels? Pretty? As we drive by them, yes. But take a closer look, these non-native, but once popular ornamentals, have large thorns, have week branches, and grow thickly. This thick growth prohibits beneficial native plant life from growing. Calleries cross-pollinate easily and produce small pears, which birds eat and, then, poop seeds through the countryside — resulting in more calleries. Enjoy the view and learn from them — that is probably the only good I can say about them. Callery pear trees along Route 130 in East Windsor, Mercer County. A closeup of callery pears in Monroe, Middlesex County. Burlington: 1.94 inches at Joint Base McGuire Dix Lakehurst to 2.50 at Southampton. Hunterdon: 2.34 at Lebanon to 2.51 at Readington. Mercer: 2.33 at Trenton-Mercer Airport. Somerset: 2.20 at Middlebush to 2.83 in the Hillsborough area. Bucks County, Pennsylvania: 2.85 at Doylestown Airport. 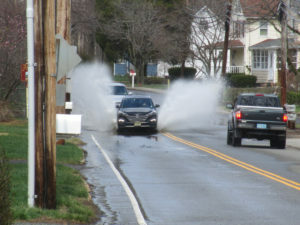 Flooding at Saw Mill Brook in Helmetta, Middlesex County. Monmouth County: 47 miles per hour at Sea Girt. Ocean County: 51 miles per hour at Tuckerton and Joint Base McGuire Dix Lakehurst. 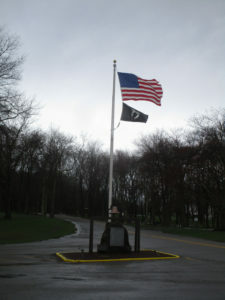 The wind whips these flags at Thompson Park on the boundary of Jamesburg and Monroe in Middlesex County on Monday, April 16. 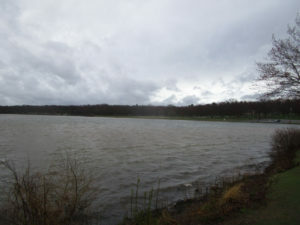 “Jamesburg Lake” (properly Lake Manalapan) at Thompson Park on the boundary of Jamesburg and Monroe, Middlesex County, is wind-driven Monday, April 16. GROUNDHOG IN THE WATER: I do not think of ground hogs, “Marmota monax,” and water going together. 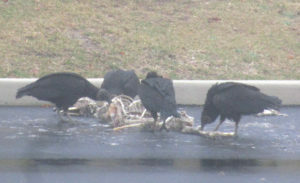 But I spooked one near Manalapan Brook. A hole dug under a tree was flooded, but the ground hog fled me, into the flooded hole. At 61-years-old, all my life in these Pine Barrens around Helmetta, I still learn. 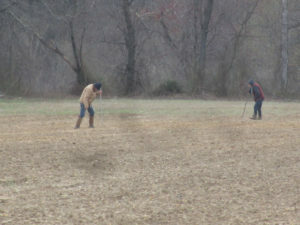 Two women searching for American Indian artifacts in a farm field on the Cranbury-Plainsboro boundary, Middlesex County. 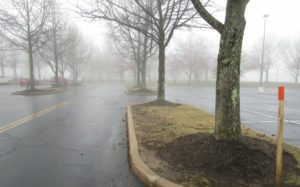 SNOW: I received a report of snow falling Tuesday, April 17, in the Cranbury-Plainsboro area of Middlesex County. Since the winter of 1995-1996, this would be the latest snowfall I am aware of in South Middlesex County. Previously, I knew of April 16 in 2007. This season, I recorded 42.5 inches at my home in Monroe, Middlesex County; Normal, based at New Brunswick about 7.5 miles away, would be about 26 inches. Basically, half of this season’s snow did not fall until March 2 or later. A double-crested cormorant, “Phalacrocorax auritus,” on “Jamesburg Lake” (properly Lake Manalapan) on the boundary of Jamesburg and Monroe, Middlesex County. SHAD RUN: I ran into Don Kamienski, a field editor for The Fisherman magazine, at this year’s Outdoors Writer’s Workshop, sponsored by the state Division of Fish and Wildlife. Don, who lives along the Delaware River in Burlington County, told me the shad were already running up the river. The annual Shad Fest in Lambertville, Hunterdon County, is Saturday and Sunday, April 28 and 29. More information is available at http://www.shadfest.com. Shad Fest, 2011 — Various festival posters and one of the artists involved. BEWARE THE LANDSCAPER: As it warms and we get into our yards and gardens, beware of hiring landscapers or gardeners. Have some reasonable faith in them. For example, I see way too much “volcano” mulching, rather than the proper “doughnut” mulching. The buildup of volcano mulching invites fungus into the mulch and disease into the tree. (Why mulch at all?) Also, I see white rock circles around trees; It just heats up the tree. Another recent sighting was a lawn treatment of topsoil on top of old lawn, then a seeding on top of the topsoil; One, it is the wrong time of year to properly plant a lawn and, two, why not remove the old lawn and aerate? Also, topsoil is not regulated, so try to make sure you know what you are getting. 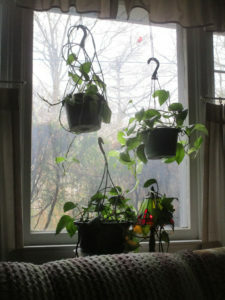 Houseplants in the living room window in my house in Monroe, Middlesex County. A cardinal, “Cardinalis cardinalis,” perched in a tree outside the window. 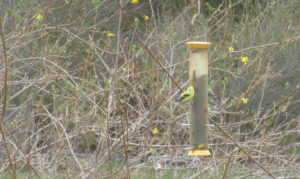 GOLDFINCHES, SKUNK CABBAGE, ETC. : Another sign of spring is the yellowing of male eastern goldfinches, “Spinus tristis.” “Spring males are brilliant yellow and shiny black with a bit of white,” according to Cornell University’s All About Birds website. “Females and all winter birds are more dull, but identifiable by their conical bill; pointed, notched tail; wingbars; and lack of streaking. …The brightening yellow of male goldfinches each spring is one welcome mark of approaching warm months.” This species is the New Jersey state bird. 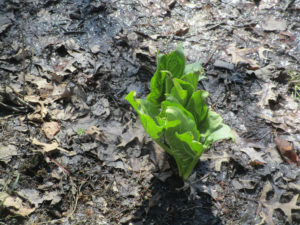 And skunk cabbage, “Symplocarpus foetidus,” is greening up in wetlands. Two eastern goldfinches, the colorful male on the left and the duller female on the right, on my backyard finch feeder in Monroe, Middlesex County. Skunk cabbage in the Millstone River floodplain on the boundary of Cranbury and Plainsboro, Middlesex County. 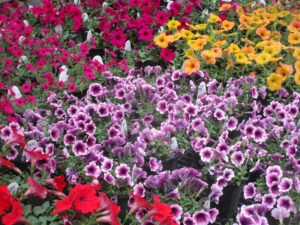 Blooming flowers at Tony’s Farm and Garden Center in Robbinsville, Mercer County. 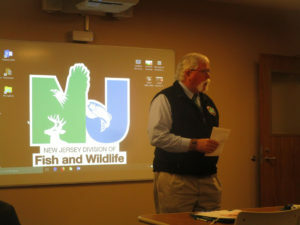 DRIVE-BY NATURALIST: I was driving to a Monmouth County section of the state’s Assunpink Wildlife Managment Area to attend the annual Outdoor Writer’s Workshop, sponsored by the state Division of Fish and Wildlife. While driving on Route 539 in East Windsor, Mercer County, a male northern harrier, “Circus hudsonius,” flew only a few feet off the ground and only a few feet in front of my Jeep, crossing my path from left to right. This sleek hawk is one of my favorite birds of prey. To see one close-up, if only only a glimpse, is a sight. 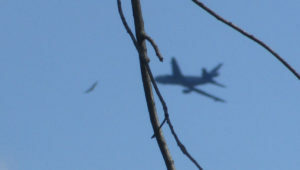 Because it was a quick-happening event, I was unable to photograph the harrier. 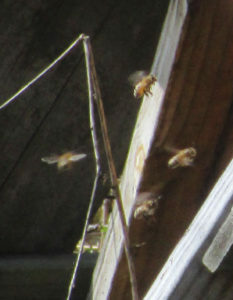 Pollinators, honeybees on the Kiesler farm along the boundary of Cranbury and Plainsboro, Middlesex County. Larry Herrighty, director of the state Division of Fish and Wildlife, welcome attendees to the 2018 Outdoor Writer’s Workshop. 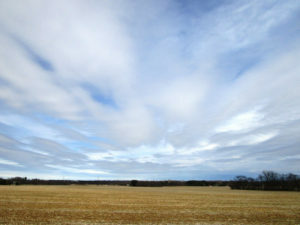 A vanishing scene of farmland, here on the Cranbury-Plainsboro boundary of Middlesex County. 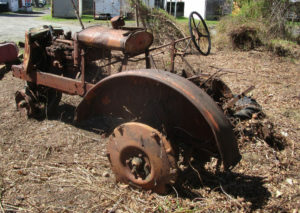 VOICES FROM AFIELD, FRANK ULATOWSKI: Frank Ulatowski, an outdoorsman-friend from Manalapan-Englishtown, Monmouth County, is looking to get rid of circa late 1930s-early 1940s Allis Chalmers tractor. In its deteriorated condition, it probably would be best used for parts. Frank is reachable at Frank’s Auto Repairs in Manalapan-Englishtown, telephone 732-446-7616. The circa late 1930s-early 19402 Allis Chalmers tractor in Manalapan-Englishtown, Monmouth County. 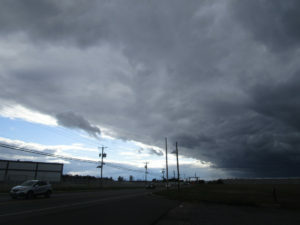 SKY PHOTOS: This week’s sky photos are from the areas of Helmetta, Monroe, Cranbury, Plainsboro, South Brunswick, and East Brunswick in Middlesex County; Upper Freehold in Monmouth County; and East Windsor and West Windsor in Mercer County. 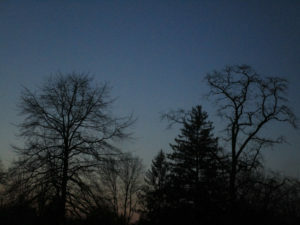 A night view from my backyard in Monroe, Middlesex County. 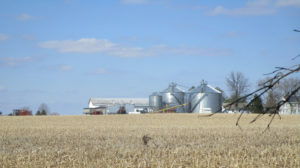 The Kiesler farm on the boundary of Cranbury and Plainsboro in Middlesex County and East Windsor, Mercer County. The Kiesler farm looking toward the Cranbury, Middlesex County, side. 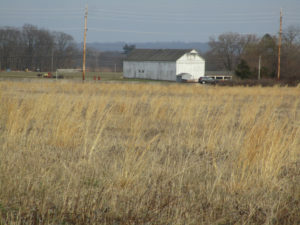 The Kiesler farm on the boundary of Cranbury and Plainsboro, Middlesex County, looking toward Grover’s Mill, Mercer County. 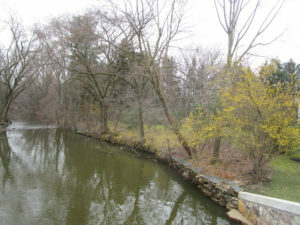 Along the Millstone River on the boundary of Plainsboro and Cranbury on the Middlesex County side and East Windsor and West Windsor on the Mercer County side. 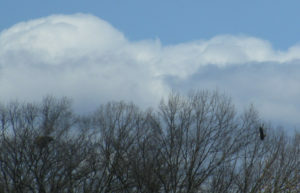 From my backyard in Monroe, Middlesex County. 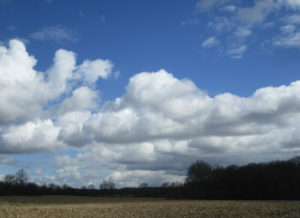 Sky over the cuesta geologic formation in Upper Freehold, Monmouth County. 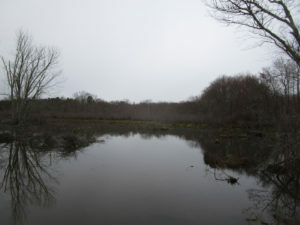 Over a swamp hardwood forest on the boundary of Helmetta and East Brunswick, Middlesex County, in the Pine Barrens around Helmetta. SUNRISE AND SUNSET: For the week of Sunday, April 22, to Saturday, April 28, the sun will rise about 6:10 to 6 a.m. and set about 7:45 to 7:50 p.m. For the week of Sunday, April 29, to Saturday, May 5, the sun will rise about 6 to 5:50 a.m. and set about 7:50 to 7:55 p.m.
NIGHT SKY: The next full moon is April 29, the Sprouting Grass Full Moon. 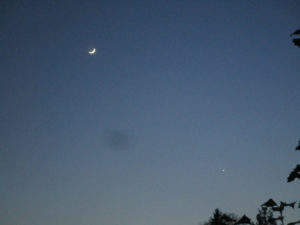 The crescent moon and the planet Venus, from my backyard in Monroe, Middlesex County. ATLANTIC OCEAN TEMPERATURE: The Atlantic Ocean temperature off New Jersey was about 51 degrees. 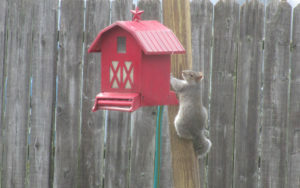 A squirrel, “Sciurus carolinesis,” at my backyard bird feeder in Monroe, Middlesex County. 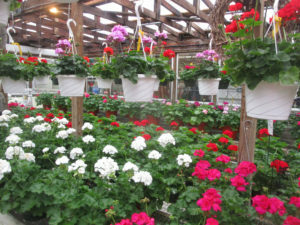 Inside the greenhouse at Tony’s Farm and Garden Center in Robbinsville, Mercer County. 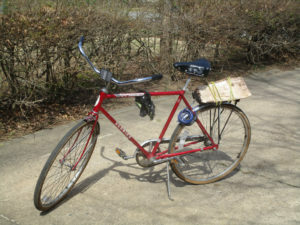 My coaster bicycle hauling firewood. BURNING THE LOG: After watching on television my Toronto Maple Leafs beat the Boston Bruins is a National Hockey League playoff game, I went to my woodstove in my garden and threw in the log. I figured I would hang out under the stars on a cool night with a warm woodstove. Well, I gave up that idea when I realized I was smoking out the neighborhood. I guess the log was too wet. So, I watered down the fire and called it a night. 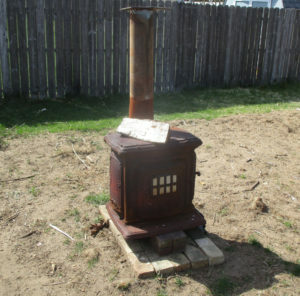 The woodstove in my garden with the log on top. 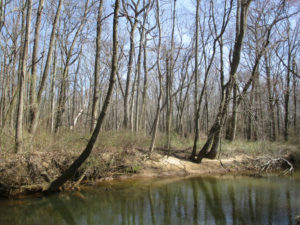 Matchaponix Brook near Englishtown Market in Manalapan, Monmouth County. This section of the brook is both diamond and rough — a beautiful natural world fighting the nonpoint-source pollution along Route 527. Brook in the foreground, swamp hardwood forest in the near background, and in the left of the far background, pitch pine trees of the Spotswood Outlier, disconnected from the main section of the Pine Barrens to the south. MATCHAPONIX BROOK AT ROUTE 527: I am 61-years-old and have been crossing Matchaponix Brook at Englishtown Market in Manalapan, Monmouth County, since as far back as I can remember. Yet I never gave much thought to the natural world here — until Englishtown outdoorsman Gary Forman relayed information to me through our mutual friend, outdoorsman Frank Ulatowski. This is the beginning of Matchaponix Brook, formed by the joining of Weamaconk Creek and McGellairds Brook. When I stopped by this week, I was amazed. Step only a few feet away from busy Route 527 and one is in a beautiful natural world of brook; swamp hardwood forest; a lodge of beaver, “Castor canadensis”; mallards, “Anas platyrhynchos”; great blue heron, “Ardea herodias”; and the telltale pitch pine, “Pinus rigida,” of the Pine Barrens because this is part of the Pines’s disconnected Spotswood Outlier. Probably plenty more that I did not notice. Unfortunately, I did notice the nonpoint-source pollution — garbage gathering in Matchaponix Brook. Take away this garbage and the busyness of Route 527 and I was in a wonderful natural world. Again, we should keep our eyes open because the natural world is around us, even if we taint it. 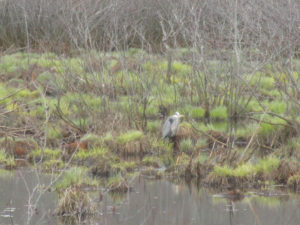 A great blue heron on Matchaponix Brook in Manalapan, Monmouth County. AS BEAUTIFUL AS MATCHAPONIX BROOK IS AT ROUTE 527…: Nonpoint-source pollution — basically debris, such as litter or materials blown offsite, with no specific origin — is a major problem in our world. Simply look at litter along a road or, in this case, gathered in Matchaponix Brook at Route 527 in Manalapan, Monmouth County. Generally, the source of this garbage appears to be debris that drains into the brook and Route 527 littering. 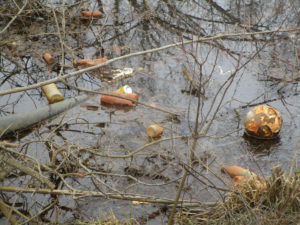 Garbage in Matchaponix Brook at Route 527 in Manalapan, Monmouth County. Mallards on Matchaponix Brook in Manalapan, Monmouth County. SPRING SPRINGING: People are fishing. Listen in the early morning and you will likely hear birds singing. 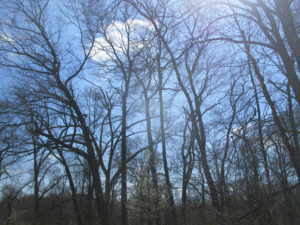 Look at a woods and you likely will see the red buds of trees. Flowers are blooming in gardens. Nature is coming alive with spring. Warren Kiesler churns up horseradish plants on his farm in Cranbury, Middlesex County. To the right of the tractor in the background, notice the tree budding. 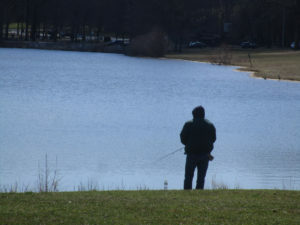 An angler at “Jamesburg Lake’ (properly “Lake Manalapan”) on the boundary of Jamesburg and Monroe, Middlesex County. 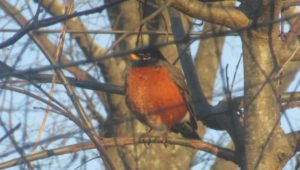 ROBINS IN THE YARD: With the coming of spring-like weather, it means the likelihood of seeing robins, “Turdus migratorius,” in our yards. I have noticed more of them around my yard in Monroe, Middlesex County. 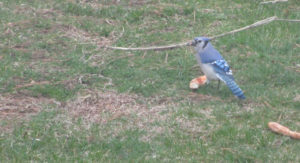 This week, I watched a robin pull a worm from my garden. “Although robins are considered harbingers of spring, many American Robins spend the whole winter in their breeding range,” according to Cornell University’s All About Birds website. “But because they spend more time roosting in trees and less time in your yard, you’re much less likely to see them.” As the weather warms and nature comes alive, they move to yards because of the availability of such things as worms. “American Robins are common sights on lawns across North America, where you often see them tugging earthworms out of the ground,” according to the Cornell website. A robin in the shrubs of my front yard in Monroe, Middlesex County. 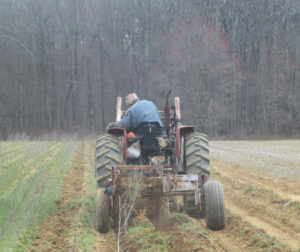 HORSERADISH FARMING: With the collapse of newspapers and, in turn, the collapse of my approximately 35 years as a reporter – basically from 21-years-old when I got my journalism degree to 55-years-old – I am always looking for work. Over those 5-plus years, I have been a part-time staff writer on a weekly paper, freelance writer, writing teacher, security guard. Security guarding, which I did during my college years and resumed these years later, now takes me from a Central Jersey professional park to the perimeter around foreign cargo ships where Maryland’s Patapsco River meets Chesapeake Bay. As I like to say, I have the best syntax at the Baltimore docks and am the only employee of Rutgers University’s Plangere Writing Center that wears a hard hat on his other job. This week, at 61-years-old, add laborer at the Kiesler horseradish farm to my resume. 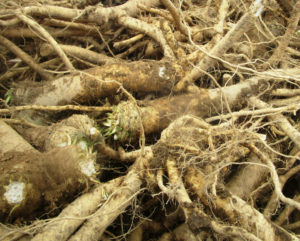 Harvested horseradish on Kiesler farm in Cranbury, Middlesex County. SNOWBIRDS GOING, GOING…: When will “snowbirds” — juncos, “Junco hyemalis” — be gone for the season? Based on field notes I have kept over the years, they should be leaving Monroe, Middlesex County, any day now to about April 25 or so. They will head to high ground, as close as North Jersey or Pennsylvania or as far as Canada. Then, I will see them again around the yard about mid-October to early November. Manalapan Brook in the section of Monroe between Helmetta and Jamesburg, Middlesex County. IN MY GARDEN: I finished the planting of the early spring crop — Kaleidoscope Blend Carrots, Touchon Heirloom Carrots, Bloomsdale Long-Standing Heirloom Spinach, Early Wonder Heirloom Beets, and Salad Bowl Lettuce, all Burpee products. YARDWORK: I tackled the first yardwork of the season, working the front yard. I trimmed trees and prepared soil to plant zinnia and warm-season vegetables. The latter is a continuation of my plan to make my one-quarter-acre yard as productive as possible. With that idea, I am trying to minimize a generally unproductive lawn as much as possible. Awaiting a movie at the Princeton Environmental Film Festival. Dr. Joe Heckman, who spoke on organic farming at the Princeton Environmental Film Festival. 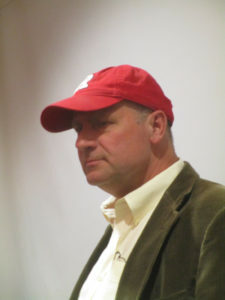 Joe is an organic farmer, a member of the board of directors of Northeast Organic Farming Association of New Jersey, and Rutgers University soil scientist. 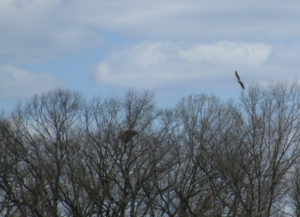 An adult bald eagle landing on the Upper Millstone River nest. GARDEN WRITING: A great pleasure of mine is to be back at the Princeton Adult School this semester, again teaching non-fiction writing. In the past, I have taught the essay and the vignette. This semester, the course is called “Garden Writing,” but is really about gardens, the outdoors, or nature. Because of its title, the course has drawn a class of passionate gardeners. This passion inspires wonderful stories. Just this week, I have read papers about dandelions, beginning spring plantings indoors, tomatoes and their guests of the hornworm and Braconid wasp. The dozen or so in this class make it a joy to teach. THINGS THAT DO NOT BELONG: Just because something is outdoorsy does not mean it belongs everywhere in the outdoors world. On the Millstone River on the boundary of East Windsor, Mercer County, and Cranbury, Middlesex County, I noticed ornamental daffodils growing in the river floodplain. I suspect these were purposely planted or they grew from waste soil. They looked pretty along the river, but they are a non-natives that do not belong there. These daffodils look pretty blooming along the Millstone River on the boundary of Cranbury, Middlesex County, and East Windsor, Mercer County. But they are ornamentals that do not belong in the wild. 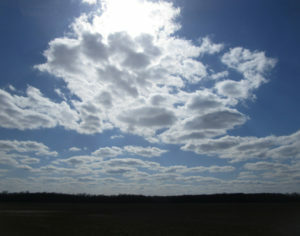 SKY PHOTOS: This week’s sky photos are from Monroe, Cranbury and Plainsboro, all in Middlesex County. 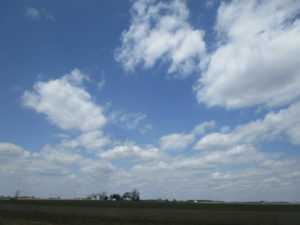 Sky above farmland in Monroe, Middlesex County. 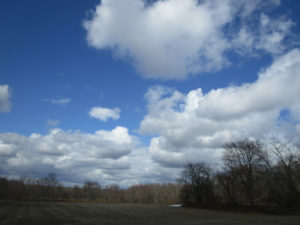 Sky above farmland in Cranbury, Middlesex County. 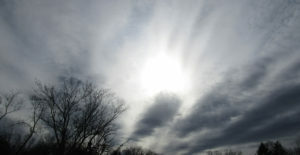 Above my backyard in Monroe, Middlesex County. Above farmland on the Cranbury-Plainsboro boundary, Middlesex County. 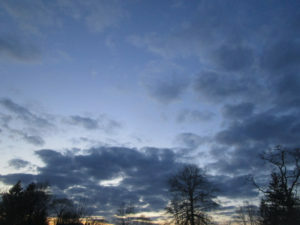 SUNRISE AND SUNSET: For the week of Sunday, April 15, to Saturday, April 21, the sun will rise about 6:20 to 6:10 a.m. and set about 7:35 to 7:45 p.m.
A Piedmont boulder field on the Princeton Ridge in Princeton, Mercer County. Notice the lichen growing on the rocks. Lichen is a sign of fresh air. MOON: The next full moon is April 29, the Sprouting Grass Full Moon. ATLANTIC OCEAN TEMPERATURE: The Atlantic Ocean temperature off New Jersey was about 46 to 52 degrees. 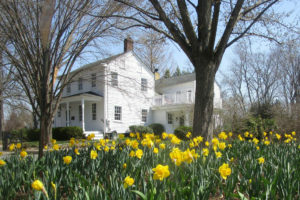 Daffodils in bloom in Cranbury, Middlesex County. 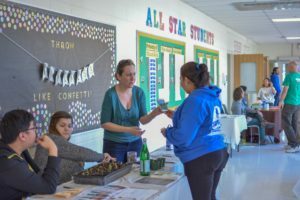 On a bright morning at 10 AM in the hallways of A. Chester Redshaw Elementary School, tables from multiple community groups lined the halls in anticipation of the 7th Annual New Brunswick Food Forum organized by the New Brunswick Community Food Alliance (NBCFA). Most of the interest groups were related to food and health within the local community and, as the first visitors started to file in, it was evident that these were topics of both concern and interest. Soon the hallways were bustling with adults and children alike from the surrounding neighborhoods. The Lower Raritan Watershed Partnership (LRWP) table was promoting the importance of pollinator plants (plants that attract pollinator species) as we handed out milkweed seeds and vegetable seedlings. Children could choose to plant their own milkweed seed at one of our tables and many of them enjoyed the opportunity to get their hands dirty. Pollinators are animals that assist in the fertilization of plants by transferring pollen from the male anatomy of the flower to the female parts. Pollinators can include bees, butterflies, bats, and birds and are essential for plant biodiversity. The number of pollinators in an area has a direct and positive correlation with the general health of an ecosystem. When these biotic vectors rifle around within the flower looking for nectar, pollen gets stuck to their legs or bodies and when they go to the next flower they take that pollen with them. This allows for diverse genotypes within plant populations that would not be seen without the assistance from pollinators. The LRWP’s goal in handing out milkweed was not only to encourage an increase in pollinator populations in our urban community, but to also increase public awareness and involvement. We asked that people tend to their milkweed plant and watch it grow for two months, then join us and the New Brunswick Environmental Commission for a “pollinator planting day” on Sunday June 17. At that time the plan is to plant the milkweed seedlings and other pollinator plants in New Brunswick’s Buccleuch Park Pollinator Garden. Though most of the people who visited our table were initially unsure what a pollinator was, many took an interest in the health of our environment and were enthusiastic about the prospect of taking an active role in its prospective remediation. The ability of our environment to efficiently and cohesively function is of drastic importance to every single person that lives within it. Conveniently enough, that same environmental ability depends mostly on the decisions made and actions taken by our very own species. As Earth day rolls around, it is vital that we reflect on anthropogenic interference in nature and take responsibility for the consequences of over-development and urbanization. If most of the damage to the planet is caused by humans, then it is a logical conclusion that humans also possess the solution. 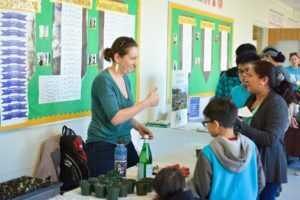 Events like the Food Forum that engage community education and interaction are integral for the remediation of our planet and decreasing the prevalence of apathy and ignorance within our population. 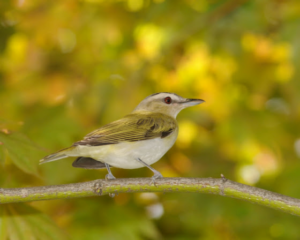 A red eyed vireo briefly descends from the treetops to provide a fleeting glimpse of one of the most common, yet rarely seen birds, east of the Mississippi. March is the last piece of evidence needed to prove winter has gone by. No matter the weather March brings, her legacy of cold and snow, as the step child of winter, is invalidated by “the first day of spring” conspicuously stamped twenty-one days into the month on just about every calendar printed. Further visual proof needed to allay the fear that winter is here to stay, are the strands of migratory birds that precede peak migration in the next couple of months. Perfectly positioned between two rivers that lead to the sea and link to the main Atlantic flyway, Branchburg comes alive with colorful winged migrants. 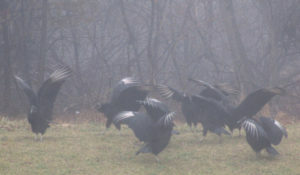 Some birds are just passing through while others stay to establish breeding territories. You don’t really need to be a graduate ornithologist with the ability to differentiate a magnolia warbler from a black throated warbler to enjoy all the feathered gems that pass our way in spring. During a recent snowfall the view of several brilliant red, resident cardinals, dodging among the tight branches of a nearby holly tree resplendent in dark green leaves and an overabundance of red berries was a sight to behold. 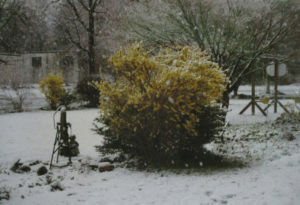 The gently falling snow turned the scene into a living Christmas card. Bird seed scattered on the ground immediately near the back glass sliding door was being appreciated by a flock of brave juncos. The scene was calm and predictable with an occasional song sparrow darting across the stage. Suddenly, standing on the ground next to the glass was what appeared to be a Parula warbler. I ran for the camera to no avail as the little bird disappeared quicker than a shooting star. It didn’t seem plausible that a warbler would be in this area so early but there it was. Looking through the, ‘guide to field identification, Birds of North America’, I reviewed the dazzling array of warblers each differentiated by plumage unique to adult and juvenile, male and female with a cautionary note on hybrid warblers and seasonal plumage. I guess it was a male Parula warbler. The conflict of identification versus the excitement at seeing a strange colorful bird lingered for a moment until I realized it was the sight of the bird that provided the magic. Knowledge of the scientific classification was irrelevant to the enjoyment of simply noticing something that appeared to be different and gave pause to a moment of thoughtfulness or beauty. As an example, you might gaze upon a stunning portrait of another person or a dreamy sunset and immediately be drawn in even though you have no idea of the person’s name or the location of the sunset. Beauty is its own reward and needs no further qualification. Birds are creatures which reflect the colors that dripped from God’s palette of infinite hues used to paint the portrait of life. One could argue ‘colors’ have wings to spread nature’s beauty far and wide and taken together they are called, ‘birds’. Soon the area will be crowded with migrating birds, the most colorful of which are the warblers. A walk along the river flyways while scanning the treetops will reveal small flocks of birds that look like no other you have ever seen. The bright plumed breeding males will be the first to arrive as they travel in the safety of numbers. It is hard to imagine that these diminutive delicate appearing birds migrate yearly to Central America, Mexico and the West Indies from New Jersey and points north. After arriving in breeding areas, the males separate to set up mating territories defended by trilling songs sung loud and often. The colorful and numerous male warblers representing several species are spectacular to observe in their diversity of color swatches, masks, vests, necklaces and caps. Each color pattern represents a different species despite similar size and intermingling of flocks. Even the most ‘nature oblivious’ and ‘nature neutral’ observers may have their heads compulsively turned by the accidental appearance of a flash of tropical color among the local treetops. Perhaps a seed of curiosity may be sown, nurtured and cultivated from a brief encounter with a spring warbler. That dangling thread of gangly curiosity left by a Magnolia warbler or Yellowthroat can easily draw the observer into the world of nature to wander and wonder at the infinite complexities that bind all living things. To believe beauty is only skin deep and fleeting is to ignore the power, depth and satisfaction the beauty of nature has to offer. Asking nothing in return, not even requiring that you can differentiate a Rufous sided towhee from a Cape May warbler, beauty exists only to be appreciated. Eager and hungry fox pups survived the mercurial spring floods to feed voraciously on mom in the bright sunlight of a late April morning. April is the quintessential month of spring, the first month to start with a vowel after a bleak winter of hard consonant constructed months. The name April is probably derived from the Latin infinitive, aperere, ‘to open’, but that consideration is at the risk of offending the claims of the goddess of love, Aphrodite, and Apollo the son of Zeus, their namesake month. I see April as a grand series of ever changing dance steps performed in tune to the great celestial choreography of the planets and stars. One planetary misstep and the world comes crashing down. It is, however, a play without flaw that brings the predictability of the seasons and the impish April to improvise her set of daily surprises that precede the full bloom of May. April is a charming minx with dancing green eyes whose mercurial ways give false hope to early gardeners as she whirls in the white robes of a sudden snow squall. Days of bright sunshine are mixed with bone chilling moist air, frosts and gentle rain or hailstorms of biblical proportion. These are the veils April sheds as she improvises dance steps to tease and mislead, all the while faithfully delivering the solemn promise of May. 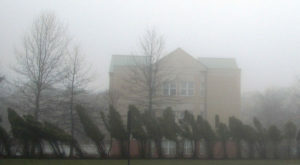 Edwin Way Teale, a noted author and naturalist claims that, “spring approaches from the south at fifteen miles a day”. If you were to drive from New Jersey to Maine in mid April, you could actually see spring approach. Travelling north, you go back in time to see spring begin. 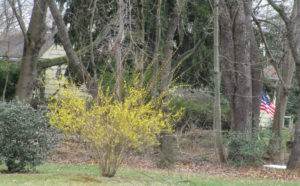 As you drive through New Jersey, forsythia planted along road medians would be in full yellow bloom as tree buds give birth to pale green leaves. Oak dominated hillsides and lowlands scattered with black gum, hard maple, beech, ash and sycamore appear as colorful as autumn with interlacing crowns covered in non reflective red, yellow, pink and salmon hued emerging leaves. The color and blooms slowly fade as you travel north. The further you travel in one day, the more the landscape appears as if drawn on individual sheets of paper flicked by hand to appear as if moving. The individual frames of the ‘movie’ become alive and reveal the living, leading edge of the manifestations of spring. The return journey south allows you to enjoy the second coming of spring and the insight that comes with a second chance. Along the South Branch, a Great Horned Owl has been nurturing a clutch of eggs that will produce at least one full sized, flightless owlet to stand constantly alert for parental food deliveries in mid April. During two trips down the South Branch in February and March, a female red fox ran along the river bank to expose herself as if to draw me away from her riverside den. She would run along the bare vertical bank then walk out onto a gravel bar, sit down and watch me approach. When I got too close she would run off and wait further downstream. 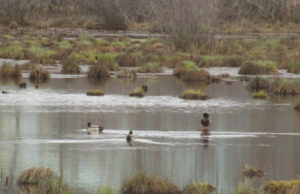 At one point she ran across a sand bar that was flanked by a pair of mallards standing on the bare ground and a great blue heron posed in foot deep water. All three birds stood perfectly still as the fox ran between them. Neither the ducks nor the heron made any move to escape as if they knew the fox was not a threat that day. I can only hope the fox waited until April to have her pups in light of the flood that came in late March. 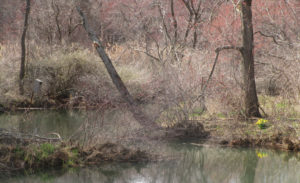 Perhaps April will reveal a gentle rain that favors the survival of not only the fox pups, but the bank swallows, flycatchers, muskrat and turkeys that might have dens or nests close to the riverbank and flood plain. It is amazing how migration, breeding, births and nurturing coincide with seasonal events as if truly participating in a dance whose every step is critical to survival. We have evolved physiologically to fit into a small, ‘temporary’ niche circling in an eddy on the river of change. If the changes take place faster than we can evolve, we go away. Despite the vagaries of April’s whim, she shows the world an emergence of life that has learned her fickle ways and dances in step to lovingly embrace such a wild partner. Here at Rock Brook on Sourland Mountain in Montgomery, Somerset County, and in other New Jersey locales, trout fishing formally opens Saturday, April 7, at 8 a.m.
ROCK BROOK: Rock Brook has its headwaters on Sourland Mountain, from which it drains about 3.2 square miles into Beden Brook below the mountain to the east in the area of Skillman Park. Beden Brook, then, crosses Route 206 and flows into the Millstone River between Rocky Hill and Griggstown. These few miles of flow are all in Montgomery, Somerset County. 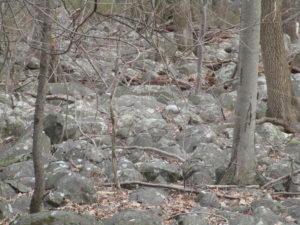 Rock Brook is filled with traprock, one of the characteristics of the Piedmont geologic area. A rite of passage of fishing, getting snagged in a tree. 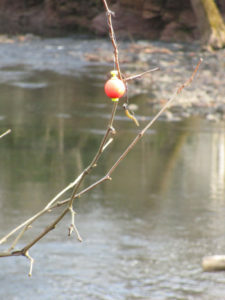 Here, a bobber and lure snagged along Rock Brook at Bessie Grover Memorial Park on Sourland Mountain in Montgomery, Somerset County. Bessie Grover was a local resident. Her history is at http://www.stoutsburgcemetery.org/stories/bessie-grover/. 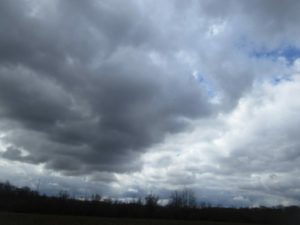 Sky photo 1: East Windsor, Mercer County. HARRY’S ARMY/NAVY: Harry’s Army/Navy, a military surplus and outdoors retail institution on Route 130, is closing. In the summer of 1974, as I headed to my freshman year at Marquette University’s College of Journalism in Wisconsin, I bought my pea coat at Harry’s for $45. Since, I have bought many a thing: shoes, shirts, denim jacket, neckerchief, belts, T-shirts, knapsack, bright orange safety vest, pocket knife, flashlight…. I am so sad to see Harry’s go. What will I do, now? 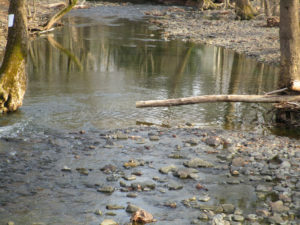 See http://www.nj.com/mercer/index.ssf/2018/03/post_180.htmland http://www.nj.com/mercer/index.ssf/2018/03/17_things_harrys.html#incart_river_index. Harry’s website, http://harrysan.com. I believe this is an oil beetle, genus “Meloe,” on my back porch in Monroe, Middlesex County. Why “oil”? Because they have a defense of secreting an oily substance. 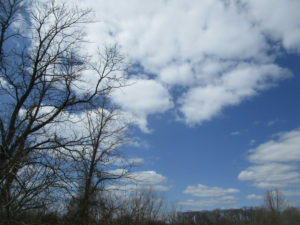 THE SOUNDS OF SPRING: As I was leaving my house in Monroe, Middlesex County, I heard the cooing of a mourning dove, “Zenaida macroura,” sounding as though it was coming from the Manalapan Brook floodplain’s swamp hardwood forest. Earlier by a day or two, I heard another bird, although I do not know the species, colorfully singing. Then, another bird singing away. Oh, and the spring peeper treefrogs, “Pseudacris crucifer,” are really calling away. This is the sound of spring. 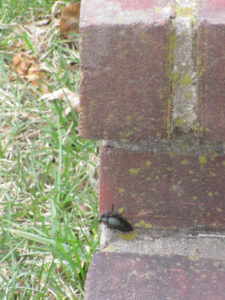 The emergence of this oil beetle on my back porch is another sign of spring. ‘ONION SNOW’: I learned a new term, “onion snow.” It means a snow that comes after onions have been planted and are sprouting or when they should be planted. In other words, a late snow that melts quickly. 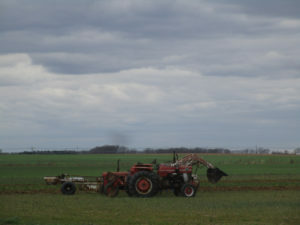 In New Jersey, the Rutgers University Cooperative Extension advises planting onions in April. So, here we are, with an “onion snow” forecast for the Sunday-Monday, April 1-2, overnight. As for wild onions, they have been sprouting for weeks. 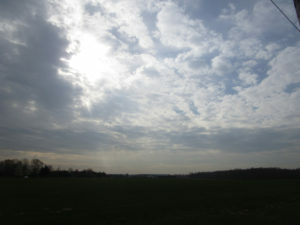 Sky photo 2: Farmland in Monroe, Middlesex County. 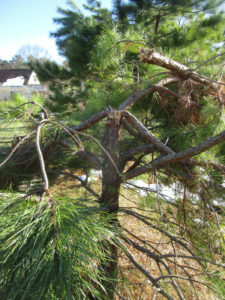 The snow-broken pitch pine in my backyard. 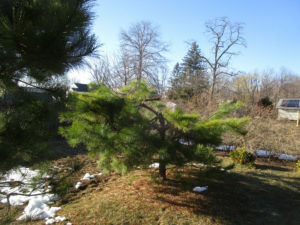 Another view of the snow-broken pitch pine in my backyard. I added the broken branches from the damaged pitch pine to the wildlife bush pile in my backyard. NO EAGLETS AT DUKE FARMS: I have been watching the live camera on the Duke Farms nest of bald eagles, “Haliaeetus leucocephalus,” pre-nor’easter snow, during a nor’easter, and after a nor-easter. During a nor’easter, an eagle covered in snow sat on an egg or eggs. Sadly the nest at Duke Farms in Hillsborough, Somerset County, is done for the season, with no successful hatching of the two eggs. 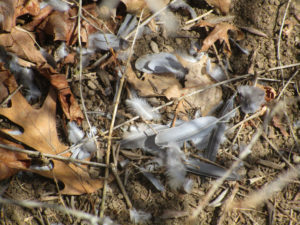 See the story at http://www.nj.com/somerset/index.ssf/2018/03/duke_farm_devastated_after_eagle_cam_nest_fails.html. This means the Duke Farms nest is done for the season. 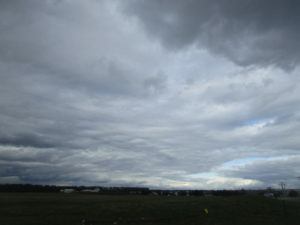 Sky Photo 3: Farmland in Monroe, Middlesex County. 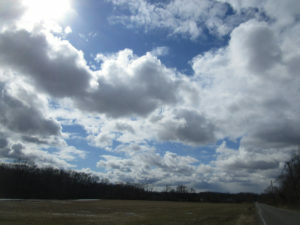 Sky photo 4: Farmland in Monroe, Middlesex County. MYSTERY OF THE BIG CATS: Recently, there have been reports of a mystery big cat in Ewing, Mercer County, and Helmetta, Middlesex County. Mountain lion? Doubtful. Bobcat? Maybe. Domestic cat? Probably. These mystery big cat sightings happen every so often. During my newspaper reporting days, I kept a file on them. Normally, they never amount to anything conclusive. Canada geese, “Branta canadensis,” at a puddle on farmland in Monroe, Middlesex County. SUNRISE AND SUNSET: For the week of Sunday, April 1, to Saturday, April 7, the sun will rise about 6:40 to 6:30 a.m. and set about 7:20 to 7:30 p.m. For the week of Sunday, April 8, Sunday, to Saturday, April 14, the sun will rise from about 6:30 to 6:20 a.m. and set about 7:30 to 7:35 p.m.
A field of Indian grass in Montgomery, Somerset County. ATLANTIC OCEAN TEMPERATURE: The Atlantic Ocean temperature off New Jersey is about 45 degrees. 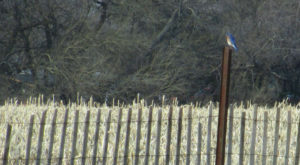 An eastern bluebird, “Sialia sialis,” sits on a snowfence post in Montgomery, Somerset County. It is a male, identifiable because of its bright colors. 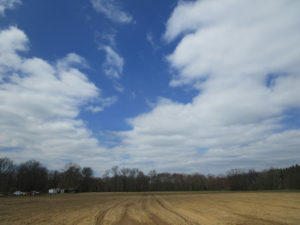 Sky photo 5: Farmland in Monroe, Middlesex County. 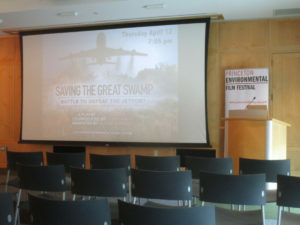 April 9 to 15, Monday to Sunday, Mercer County: The annual Princeton Environmental Film Festival, https://www.princetonlibrary.org/peff/. April 25, Wednesday, 5 to 9 p.m., in Middlesex County, Old Bridge, at the George Bush Senior Center. April 26, Thursday, 5 to 9 p.m., in Brooklyn, New York, at the Best Western Gregory Hotel. May 2, Wednesday, 5 to 9 p.m., in Somerset County, Franklin, at the Franklin Township Community Center. May 3, Thursday, 5 to 9 p.m., in Quarryville, Pennsylvania, at Solanco High School. 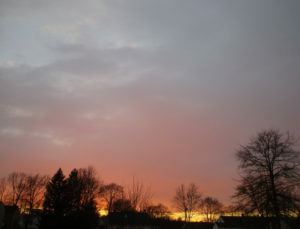 Sunset in my backyard in Monroe, Middlesex County. Joe is a semi-retired print journalist of almost 40 years. His work also is at @JosephSapia on Twitter.com, along with Facebook.com on the Jersey Midlands page.